Senator Carlucci stood with transplant survivors, advocates, and fellow lawmakers outside the Rockland County Courthouse on Tuesday to announce Governor Cuomo signed his and Assemblywoman Michele Titus’ (D-Queens) bill (S.1033/A.5159B) into law, which will allow New York taxpayers a more convenient way to give to organ donation. Now the New York personal income tax form will allow a resident to make a voluntary contribution to the Life Pass It On Trust Fund, which raises money for organ and transplant research and educational programs promoting organ and tissue donation. 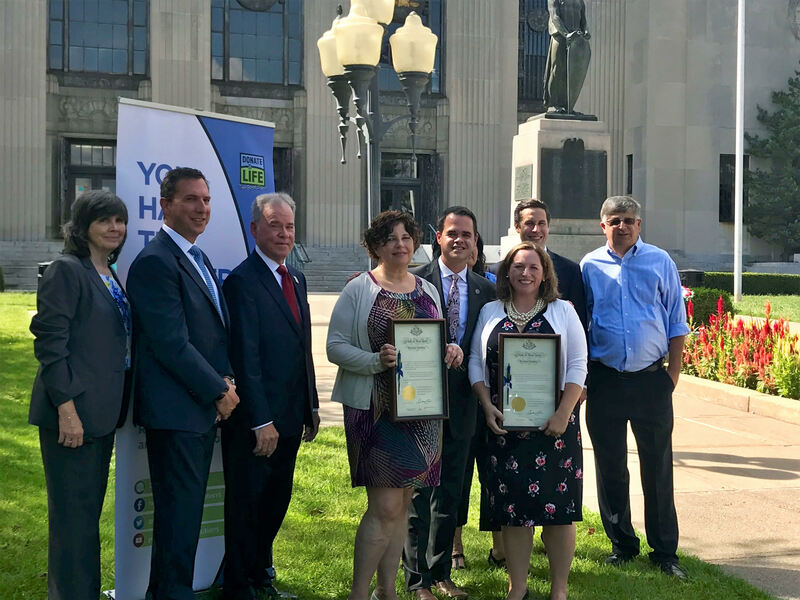 Senator Carlucci presented Donate Life New York State and LiveOnNY with the pen certificates that Governor Cuomo signed. “The NYS Donate Life Pass It On Trust Fund was created to provide support for education, outreach and research regarding the importance of organ, eye and tissue donation, and increased donations to the fund can help carry out comprehensive campaigns that encourage New Yorkers to register in the NYS Donate Life Registry. This is critical to ensuring that the majority of New Yorkers who support organ donation, but who are not in the Registry, are able to express their wish to make the gift of life and improve New York’s donation rate. 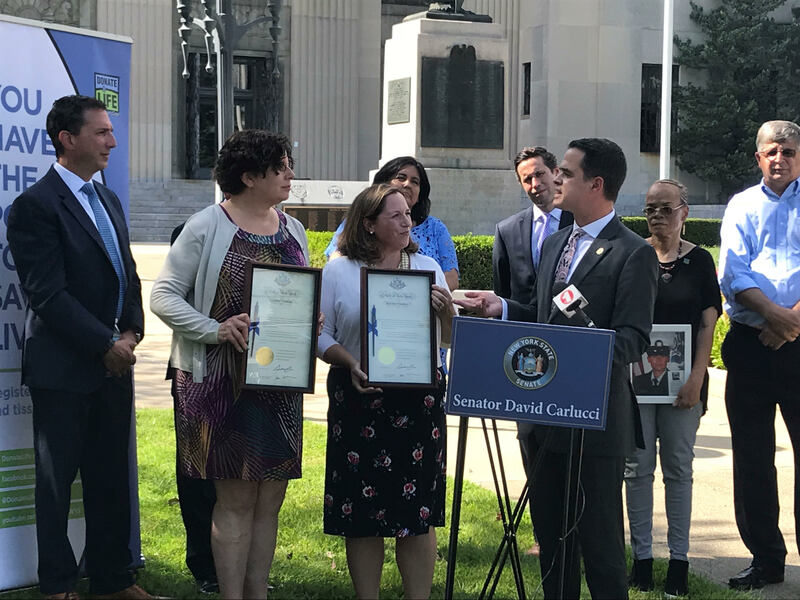 Thanks to leaders like Senator Carlucci and Assemblyman Titus, we are taking important steps like these to improve New York’s record,” said Donate Life New York State Executive Director, Aisha Tator. “Organ donation is powerful and beautiful. One organ donor can save up to eight lives and enrich the lives of many more through tissue donation. I urge all New Yorkers to consider registering as organ donors at LiveOnNY.org. I thank Sen. Carlucci for helping to raise awareness about this important issue,” said LiveOnNY’s Chief Medical Officer, Dr. Amy Friedman. Other donation advocates and lawmakers who were not at the event applauded the new law. “I am so happy that New Yorkers will now have an additional way to support organ donation via the NYS Donate Life Pass It On Trust Fund. Education on the subject of organ donation is so important to help increase the number of enrolled donors. As a heart recipient, I am so grateful that NYS Legislators continue to support this important cause,” said Lauren Shields. In 2018, charitable funds that people could give to on their income tax form generated nearly $2.2 million dollars. A donation to these funds is tax deductible.